All sessions will take place in the downtown library building on WVU’s downtown campus, in Room 2036. There is no security to enter the library. See the bottom of this page for walking directions from the Honors Hall to the library and information about taking the KairosCamp shuttle. A small, continental breakfast will be available every day of the workshop (M-F), starting at 9 am. Instruction will begin at 9:30 am and finish at 4 pm, with the exception of the first day when breakfast is at 8:30 am and instruction begins at 9:00 am. Lunch, served at noon, will be catered in every day except the last Friday. Bus: Mountain Line Transit Authority. Use the Purple Line. Cost is $1. Guest access to the Student Recreation Center is available for $10 per day with a photo ID. The pass is good on the day it is purchased. The Rec Center is on the Evandale campus, north of the Downtown campus where your dorm and the Library are located. See below for maps. All workshop sessions require participants to have a laptop computer. If you do not have your own laptop, please contact Cheryl Ball to make arrangements. Wireless access is available throughout campus. You will have a WVU guest login for wifi, or you can use eduroam if you have that service on your own campus. The residence hall also offers Ethernet access, but you must bring your own cable. If you are bringing your own laptop, make sure to download the tech listed on our git page. If you are bringing a university-owned laptop, make sure you know the admin password so you can download and install software as needed. Also bring the email and phone number of your IT person on your campus, in case we need to call them. Bring good headphones especially if you are working on audio/video materials. Bring any additional hardware, software, or peripherals you need to work on your project. 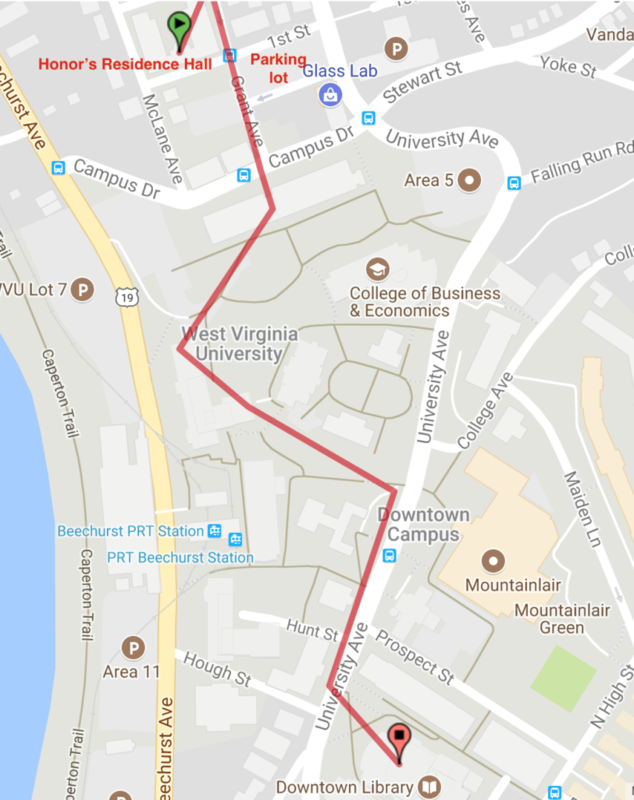 WVU is divided into three separate campuses: Downtown, Evansdale, and Health Sciences. The Honors Hall and the Library where the workshop sessions are held are on the Downtown campus. The Recreation Center, for those who wish to use it, is on the Evandale campus. Full campus maps are available here. Exit the Honors Hall building from the main doors and go right. At the crossroad, go right and walk down Grant Avenue. You will pass Parking Area 22 and apartments on your right. At the end of the street, cross the road, and enter the Life Sciences building. Walk through the hallway and walk out the exit directly in front of you. Walk toward the exterior staircase in front of you. When you reach it, take a right and walk towards Brooks Hall. Enter Brooks Hall. At the end of the hallway, go to the elevators on the right. Walk out the exit to the left. Once outside, continue walking over the small bridge. After crossing the bridge, take a right and follow the sidewalk. Once you pass the traditional stone campus buildings on your left (Woodburn Hall and Martin’s Hall/School of Media), continue until you reach the street. At the street, take a right and continue going down the sidewalk of University Avenue. When you reach Colson Hall (the third building on the right, with the big steps) the library is directly across the street on your left. Cross the street using the crosswalk. Enter the WVU Downtown Library. Take the elevator or the stairs to the second floor (both are immediately to your right as you go through the book detectors). Room 2036 is a large classroom with glass walls on the far side. You’ll probably smell breakfast. We know it can be confusing to walk through new university buildings your first time, so if you want a guide on your first morning, meet Lydia Welker at 8:10am Monday morning in the lobby of Honors Hall. She will leave promptly at 8:15am to walk you over to the library, where we will have breakfast. If you have mobility issues and need help navigating the campus, call Cheryl on her cell by 8am Monday and she can pick you up in the KairosCamp shuttle! Other transportation arrangements can be made during the workshop.